The Doctors TV show actually produced a great (and accurate) segment on a relatively new procedure called sialendoscopy. This procedure allows a surgeon to remove a stone that may be blocking your spit gland from draining saliva into the mouth. This is analogous to a kidney stone which blocks urine from draining from the kidney into the bladder resulting in painful swelling of the kidney (causing flank pain). 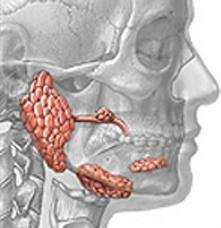 How does a person know if they have a salivary gland blockage due to a stone? There is a painful swelling located right in front and/or below the ear if the parotid gland is affected, or under the jawbone if the submandibular gland is blocked. If the blockage persists long enough, it may lead to an infection of the gland itself (sialadenitis). Traditionally, if the stone doesn't pass on its own with conservative measures, stone removal required surgical removal of the entire gland or making an incision and removing the stone like it's a tumor mass. Watch the video of this procedure being performed as shown on The Doctors here. At this time, Dr. Redmon in our office performs this procedure.